Christie Romero was the founder of the Center for Jewelry Studies and appeared on Antiques Roadshow as a jewelry appraiser. In this interview, published in March of 2009, she talked about collecting fine and costume jewelry, specifically focusing on the various styles, eras, materials, designers, and manufacturers. Christie wrote three books on jewelry. Her last was Warman’s Jewelry, 3rd Edition. 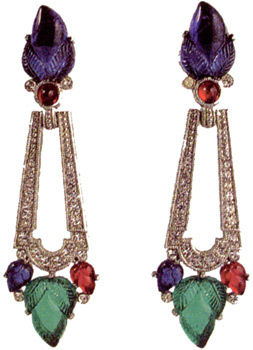 Earrings with glass and rhinestones, c.1990 by Givenchy. "Fruit salad" motif. I started out with general antiques and collectibles… I was a dealer for a while and bought and sold all kinds of things. Gradually jewelry became my focus. In the mid-1980s I started getting serious, and in 1988 I started teaching small classes, workshops, and seminars, primarily on costume jewelry but also some fine jewelry. Vintage costume jewelry was just beginning to take off as a collectible. Up until that time, most people thought it was junk. They didn’t understand what it was about. I liked the history and the look of it, and when I was buying and selling, it was a lot easier to carry jewelry and set it up than furniture or pottery or porcelain. When I started, I didn’t collect. I just bought and sold everything. I don’t even want to think about some of the things that I let go. But now I’m a collector, not a dealer. Eventually I got into fine jewelry as well and I became a gemologist. I went through a gemology program and got my certificate. When I started teaching, there really wasn’t any place one could go to learn about antique and period jewelry. I learned by asking a lot of questions and handling jewelry. That’s what I tell my students to do. I use my collection to teach; I call it my study collection. Hands-on is really the best way of learning. Collectors Weekly: What is period jewelry and how is it different from antique or vintage? Romero: Technically, antique jewelry is anything that’s 100 years old or more, and then after that it’s period. So if it’s, say, from the 1920s or ‘30s, that would be period. When I say period jewelry, I’m talking about specific timeframes that are less than 100 years old. Vintage jewelry is often the term that’s used for costume jewelry. It’s a vague term just meaning jewelry of a certain time period, but it’s more commonly applied to costume jewelry than fine jewelry. I cover all kinds of jewelry. The only thing I really don’t get into is ethnic jewelry, or jewelry from other lands like Asia and Africa and things like that. I cover Western, European, American, Mexican, and Scandinavian jewelry. My collection is very eclectic because I use it to teach. As for my personal favorites, I tend to be a modernist. I like simplicity and good design and good craftsmanship. I collect Mexican Taxco silver jewelry and jewelry from all of the Scandinavian countries – Denmark, Norway, Finland, Sweden. I have a fair amount of Scandinavian jewelry. It’s hard for me to say that any one thing is a favorite because I really do love it all. Collectors Weekly: How is Scandinavian jewelry different from, say, European or Western? 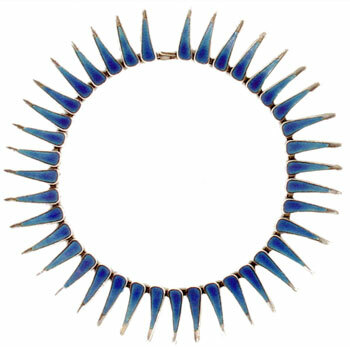 Swedish necklace with sterling and enamel, c. 1958. Makers mark "ABA" for Atelier Borgila. Romero: It wasn’t until the turn of the 20th century that the Scandinavian countries started developing their own distinct styles. Georg Jensen is a famous name, and he started his shop in 1904. His jewelry was pretty much in context with what other Danes were doing, which was basically Danish Arts and Crafts. It’s very sculptural, usually silver, and the stones are often native, like amber. In the mid-20th century, Scandinavian design really was at its peak and had its greatest influence, especially in the United States. That’s where the whole modernism idea came from. Everything was very pared down and simple. They called it functionalism. It was a departure from what the Arts and Crafts designers were doing, which was more organic with a natural, floral motif. The mid-century modernists were doing modular jewelry, individual units that were linked together, just geometric shapes. It’s a very different approach to design, and it was copied by others, especially in the United States. Modernism started evolving in Austria and Germany at the beginning of the 20th century with the Wiener Werkstätte and the Darmstadt Colony. Some of the designers were designing strikingly modern pieces in the early part of the 20th century. If you look at a piece that was designed by Wiener Werkstätte, you’ll be startled at how modern it looks for that time period. That was the cradle of modernism for jewelry, and the Scandinavians were soon after that, and then rest of Europe followed soon after. Collectors Weekly: When was the earliest collectible jewelry created? Romero: There are some people who collect ancient jewelry. It’s hard to come by, but it’s out there. The most readily available pieces are 18th-century, but I know someone who collects 16th- and 17th-century jewelry. It’s still out there, just not a lot of it. Hinged bangle bracelet with Swiss enamel, c. 1830. The oval miniature depicts a seated lady with two children within a scalloped border decorated with black and white enamel motifs. Georgian, meaning 18th century, is harder to find because not a lot was made. It was all done by hand. Also, with some of it, the stones were remounted. Stones were removed from the setting and put in something modern and up-to-date, so pieces were destroyed. Anything of intrinsic value would have possibly been broken up for its materials. Another reason why there’s not a lot around is just the fact that it’s been over 200 years and things just don’t last. Jewelry is sturdier and more resilient than some things, but the ravages of time can affect it. During the 18th Century, most jewelry featured gold and silver and gemstones. There was non-precious jewelry, but it wasn’t really called costume jewelry back then. Cut steel was used, and Berlin iron began to be used in the early 19th century. Paste, which is a glass with a high lead content, was often set in silver and sometimes gold. There was quite a bit of that in the 18th century, as well as lots of diamonds. I think diamonds would be considered the predominant stone of the 18th century, although there were some colored stones. They were often set in closed-back mounts and the mountings were lined with foil to reflect light and, in some cases, color. They enhanced the color of a gemstone. A metal that some people call pinchbeck was used, but there’s a controversy over that. It’s really just a variety of brass. It’s a specific alloy of copper and zinc. A guy named Christopher Pinchbeck came up with this so-called secret formula, an alloy that supposedly looked like gold. It was poor man’s gold, much less expensive. You’ll hear the word “pinchbeck” applied to gold-plated brass from the 18th century, but like I said, there’s a big controversy over the use of that word. The term “costume jewelry” didn’t really come into being until the 20th century. There are a couple of apocryphal tales. Some people say that Coco Chanel was the first to call it costume jewelry. Other people say Florenz Ziegfeld of Ziegfeld Follies coined the term. Another source says that the first time it was used was in the New York Times. It was sometime around 1920, after World War I, when the words “costume jewelry” were first used. Collectors Weekly: What’s popular to collect from the Victorian era? Romero: Rings, bracelets, earrings, necklaces, brooches – you name it. There’s a huge variety of jewelry from the Victorian era. There was more jewelry made in the 19th century than in all the centuries previous combined because mass production was possible and electro-plating and rolled gold made jewelry affordable to the masses. It could be produced in quantity so there was a lot of it made and a lot of it has survived. In my book, the 19th century is divided into subcategories: early, middle, and late Victorian. There were all kinds of styles. There were the revivalist styles, primarily in the mid-Victorian era, Etruscan revival, archaeological revival, Greco-Roman, Renaissance revival, all sorts of revivals, and there was naturalism in the early Victorian era. There were very realistic depictions of floral motifs and birds and animals because the Victorians were preoccupied with nature and archaeology. Collectors Weekly: You say naturalism and naturalist jewelry. Is that different from Art Nouveau? Romero: Very different. Art Nouveau lasted only for a very short time, and the designers who created Art Nouveau jewels did not depict motifs realistically. They were very stylized. There was a whole different approach to design with Art Nouveau – the female face or figure and floral and foliate motifs, but with less curves and a dreamlike quality, not realistically depicted. The way jewelry was in the early Victorian era, in the 1840s and 1850s, every flower was exactly the way it is in nature. That’s not at all the case with Art Nouveau, which was popular from about 1895 to about 1910, 1915. 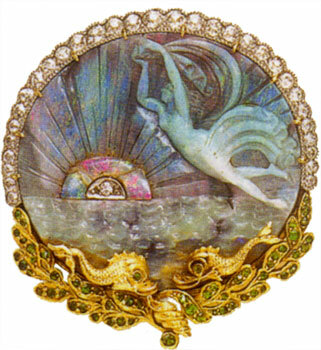 There was a fantasy aspect to Art Nouveau jewelry. Lalique, who I consider the greatest artist jeweler of all time, created pieces of women turning into insects. The way he depicted nature was just otherworldly. It was not realistic. There were others who became known for Art Nouveau, but Lalique was the cutting edge of the style. He was one of the first to exhibit at Siegfried Bing’s gallery, which was called L’Art Nouveau in Paris and was opened in 1895. His designs are just the most imaginative and his use of materials was very unorthodox. He combined precious and non-precious materials, and he even used celluloid in some of his jewels. He didn’t use precious materials for their intrinsic value; he used them for their effect. He was one of the main users of Plique-a-Jour enamel in combination with gold and gemstones and other materials, like glass. Eventually he turned to glass exclusively and there was a transitional period where he was using molds for both jewelry and objects, so there are production pieces by Lalique that date to around 1910 and later. Eventually he abandoned jewelry and devoted his career to glass objects. His early pieces were one of a kind. There were, I think, 147 pieces that were commissioned by a man named Calouste Gulbenkian who was Portuguese. Those pieces are now in the Gulbenkian Museum in Lisbon, Portugal. There are so many books about Lalique and his jewelry. There are so many reasons why he was considered the greatest, but those are the things that come to mind. Collectors Weekly: Are there jewelry designers from the Victorian period that are well-known and sought after? Romero: Certainly. Among the revivalists, the most well known and revered are the Castellani, a family of Italian jewelers. Fortunato Pio Castellani was the founder of the firm in Rome, and he actually replicated ancient jewels that were being excavated from archaeological digs. They found these magnificent gold objects and jewelry by the Etruscans, and granulation was a technique that the Etruscans used, so Castellani strove to duplicate that technique. He did some pretty spectacular things, some of which are line-for-line copies of the ancient jewels while others are just copies of the style. There weren’t huge numbers of designers in the United States who made names for themselves in the 19th century. There were a bunch of manufacturers in Newark, New Jersey, who started working in the mid- to late 19th century, like Riker Bros., Unger Brothers, and William B. Kerr. Unger Brothers and Kerr primarily made silver jewelry. Whiteside & Blank was another prolific firm and made some wonderful things. Of course, Tiffany was the predominant jeweler in the 19th century. They were founded in 1837. Marcus & Co. is another New York firm. They are no longer in existence, but they were making jewelry in the 19th and early 20th century. Both Tiffany and Marcus are really important American names in jewelry. At the turn of the century, there was Theodore Fahrner in Germany, and the designers for the Wiener Werkstätte in Austria, like Koloman Moser and Josef Hoffmann. There were several well-known and respected jewelers who worked in Boston, the big four as we called them: Edward Everett Oakes, Frank Gardner Hale, Josephine Hartwell Shaw, and Margaret Rogers. They all reached the highest level at the Boston Society of Arts and Crafts. Arts and Crafts began in England, and Archibald Knox was one of the most respected designers who designed for Liberty & Co. Murrle Bennett & Co. and W.H. Haseler were makers of English Arts and Crafts. In the United States, Boston and Chicago were the two centers for Arts and Crafts jewelry. With Edwardian jewelry, or so-called garland-style jewelry, Cartier was the primary manufacturer, known for garland-style jewels. There were a number of other French jewelers at the turn of the century who were designing that kind of jewelry. Collectors Weekly: Do collectors tend to specialize in either fine or costume jewelry? Romero: I think again it’s a matter of personal taste. There’s endless variety, and that’s why I never get bored. I’ve been doing this for so long, but there’s always more to learn. My book covers the mid-18th century all the way through the 20th century, and then there’s sections on Native American, Mexican, and Scandinavian, as well as appendices in the back. There are all different ways of collecting. There are some people who collect by name, and jewelry is a name-driven market. Some people collect specific names in different categories of jewelry, and then there are other people who would just collect a certain style or certain materials, like the collectible plastics or rhinestones, or from a certain country. Then there are people like me who collect all kinds of things. There are some kinds of costume jewelry that actually copy fine jewelry and look real. From 10 feet away, you can’t tell the difference. Because the materials themselves are not precious, costume jewelry designers could be a little bit more adventurous. The scale could be larger because they weren’t using expensive materials and they could be a little bit more exuberant in their approach to design. There are a couple of major costume jewelry designers who are associated with certain companies. Alfred Philippe designed for Trifari in the 1930s, ‘40s, and ‘50s and his designs are sought after. Miriam Haskell is a big name, but she had other people designing for her, like Frank Hess, and there’s Chanel and Schiaparelli, who were two major clothing designers who also had costume jewelry designed for them. Verdura designed for Coco Chanel, and then he came to the United States and started designing and making fine jewelry here in the late 1930s or late 1940s. Jean Schlumberger designed costume jewelry for Schiaparelli, but then he came to the United States and became the vice president of Tiffany & Co., so he went from designing costume to fine jewelry as well. Collectors Weekly: How did Victorian jewelry in Europe differ from what was being produced in America? Romero: Not very much. The American style tended to be a bit more conservative, but without marks or provenance, it’s sometimes difficult to tell the difference. There are some people who claim that French jewelry was better made than American jewelry, but that’s not true. I can show you a piece of American jewelry that is every bit as good as a piece of French jewelry. It’s really hard to pinpoint the differences. Some people think they can tell, but I beg to differ. The United States was slow to adopt what we now call the Art Deco style. Modernism came late to the United States. Eventually we did have some great Art Deco-style jewelry, but it took a while. That’s the only difference, I think; the time period. In terms of overall style, I’d say again that Americans tended to be a little bit more restrained and conservative in their approach to design compared to the French, for example. Collectors Weekly: Could you tell us a bit about the marks? Romero: The Newark manufacturers didn’t put their names on the jewelry; they had little symbols or marks. The only way you can identify a piece as being made by a Newark manufacturer is by their marks. Not everybody marked their pieces. Tiffany did. Sometimes Tiffany pieces are marked “Tiffany & Co.” and then sometimes they have other markings, like just a “T” with an ampersand and “CO.” Gorham had what looks like British hallmarks, but they’re actually the Gorham maker’s mark. George Shiebler was another maker who used a mark. It’s an “S” and a circle with wings on either side. But sometimes jewelry isn’t marked at all, especially jewelry from the 19th century. In the 18th century, jewelry was made by hand. From the 19th century onward, lots of it was made by machine. Designers designed and other bench jewelers would actually make the jewelry. The designers are the ones who usually get the credit, and the bench jewelers were seldom as recognized, although there were some designers who were also makers, especially in certain categories like Arts and Crafts. Costume jewelry is all mass-produced, and a lot of it didn’t survive because the materials weren’t meant to survive. These pieces were made just for the current fashion and no one thought that anybody would be collecting them 100 years later or even just 50 years later. Collectors Weekly: How did World War I and World War II affect the materials that were used for jewelry? Romero: World War II had more impact than World War I. The use of metals was restricted. During World War II, platinum couldn’t be used for jewelry because it was used for industry, like catalytic converters. It wasn’t restricted during World War I, but it was frowned upon to wear. Costume jewelry manufacturers started using sterling silver during wartime because the base metals that they were using – lead-based metals, tin, nickel – were being used for the war effort. They turned to sterling silver because there was a plentiful supply in the U.S. because of the silver mines here. Today sterling silver costume pieces are higher-end and more sought after. Oftentimes they were gold-plated because colored gold was the fashion during World War II. Sometimes pieces were made with two or three different colors of gold. The costume pieces were also plated to emulate the look of fine jewelry at that time. What I call “make-do materials” were used during World War II to avoid the use of metals. Wood, plastic, felt, yarn, leather, and other non-metallic materials were used. I have a collection of pieces like that, and I know several people who have collections of jewelry made with those materials. Collectors Weekly: When was retro jewelry made? Hinged bangle Bakelite bracelet, c. 1935-45. 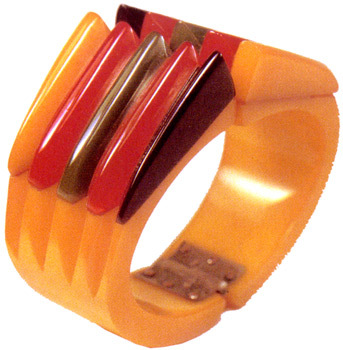 "Philadelphia" style with serrated design; butterscotch-colored Bakelite base with geometric design laminated fins. Romero: “Retro” is another term fraught with controversy. Sometimes it’s called retro-modern, and that’s another term that was applied long after the fact. It was actually coined by the heads of Christie’s Auction House and just means “looking back,” but the term has now come to be more or less accepted as referring to the style that was popular during World War II, although it began evolving in the mid-1930s. It was a sculptural figurative motif, three-dimensional and large, but the pieces were usually hollow. The stamped gold was thin, but the pieces looked substantial because they were made with hollow construction. Everything was large. That was the style of the time. Remember, jewelry always goes hand-in-hand with fashion. I’m working on a very large exhibition and catalog project of jewelry and fashion with the Fashion Institute of Design and Merchandising. We’re covering 200 years of jewelry and fashion from 1800 to 2000, and the whole idea is to put jewelry in context with the clothing with which it was worn, because jewelry doesn’t exist by itself. It’s worn on clothing, right? It makes sense to put the two together. No one’s done this before, so we’re doing it now. It’s very difficult to find the right pieces for each particular garment. FIDM has a collection of clothing, but they don’t have a collection of jewelry, so it’s my job to go find the jewelry to go with the clothing. Collectors Weekly: What about matching sets? Romero: A set is also known as a parure, and everything matches – necklace, bracelet, earrings, brooch. That was popular in the 1950s. Matching sets went in and out of fashion just like everything else. In the 1830s, matched sets of jewelry (jeweled hair combs and shoulder clasps and buckles and other things that we wouldn’t wear today) were popular. They were made in matched sets and put into fitted boxes, so you would find an entire parure set inside the fitted box. In the 1910s, ‘20s, ‘30s, and ‘40s, most of that jewelry was not worn in matched sets. It wasn’t until the 1950s that that sets started happening again. The ‘50s was almost like a return to the Victorian mindset. Everything was really prim and proper. Women wore short white gloves and their shoes had to match their purse and their hat, so the matched sets of jewelry went along with the matching of clothing with accessories. Matching sets are not always possible to find because they get broken up, but people like completing a set. Collectors Weekly: Who collects jewelry? Is there a typical collector? Romero: There are collectors of every age. People don’t start thinking about collecting for the most part until they’re in their 30s, but I know people who have been collecting since they were kids. I don’t think there’s any demographic for people who collect jewelry. There’s an endless variety of jewelry out there, so there’s something for everyone, and if you’re inclined to start collecting, you’re going to find something that suits your taste. People take my classes and come back to me later and say, “It’s all your fault. I’m out here buying jewelry and it’s all your fault!” They get into it and realize what’s out there and they get carried away. I have turned a number of people into collectors. What makes it so much fun is that it’s the one collectible you can carry around with you. You can put it on your body. I don’t think I know a single collector who just keeps their jewelry in a box or a safe somewhere. You have to wear it and enjoy it. I guess there are some people who are probably afraid that it’ll get lost or stolen, but part of the fun of collecting jewelry is that you can wear it. Lots of people choose what jewelry to wear with their clothing, but for me it’s usually the opposite – I decide what jewelry I want to wear and then I find the clothing to go with it. It’s a whole different mindset. I find jewelry at antique shows, flea markets, eBay. There are brick-and-mortar auctions as well as online. There are many websites that sell antique, period, and vintage costume jewelry. There are all kinds of ways to collect nowadays. It’s a lot easier today than it was 20 years ago. eBay is huge. There’s a ton of jewelry on eBay. Romero: The oldest piece in my collection is a mourning ring dated 1766. I treasure it because of that. It’s got an inscription and the date of death and the age of the person who died, and it’s got hair under rock crystal in the center. It’s framed with garnets and it has black enamel around the shank of the ring, which is where the dated inscription is. 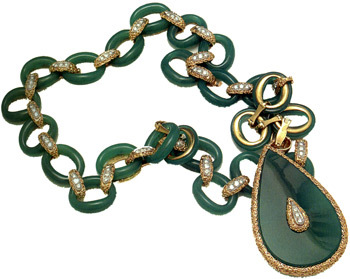 Sautoir necklace with dyed green chalcedony, diamonds, 18k yellow gold, and platinum c. 1970 by Van Cleef & Arpels. Makers mark "AV" for Vassort, Paris. Another one that comes to mind from the 19th century is a cameo. It was from a dealer’s collection, and then she decided to part with it and I had to have it. It’s a message (or allegorical) cameo. It shows three figures: Psyche, the goddess of the soul, Apollo, the god of music, shown playing a lyre, and a figure in the middle, holding a bowl in her hand and facing Psyche. Psyche and Apollo face one another. The message is that music feeds the soul. That appealed to me so much because I used to sing professionally, so music feeds my soul. It’s beautifully made; the carving on it is really superb. I like certain things from each time period. There’s a wonderful Arts and Crafts festoon necklace by Murrle Bennett. It’s enameled with a blister pearl in the middle. I love Arts and Crafts. It got to be so expensive that I couldn’t afford to buy it anymore, but that’s one piece that I really treasure. I also have a collection of Bakelite jewelry that I love because it’s fun and it makes me laugh. I have a Bakelite frog playing a stringed instrument of some kind, like a mandolin or a guitar, and when you wear him and you walk, his arm moves like he’s strumming the instrument. He’s just charming. I don’t wear him a lot anymore, but I really do like him. I also have a small collection of mid-century modern studio artist jewelry. One of my favorite pieces is by a woman named Ruth Roach, and it’s an articulated pendant in sterling silver on a leather cord that goes around the neck. It looks like a narrow necktie, but each section is connected to the next section and there are all these different techniques that were used to make it. It’s just very complex and the craftsmanship is wonderful. I love her approach to design. I don’t have diamonds and platinum and pearls, although if I were independently wealthy I would probably buy garland-style Edwardian jewels. I think that type of jewelry is just breathtaking. I don’t have a lot of costume jewelry in my collection either, but I have a couple of nice pieces – one by Marcel Boucher, a big, bold, sculptural carnation clip that I really like. I also have a Trifari jelly belly that’s a penguin. My husband and I collect penguins in general – we have a collection of penguins of all different materials and sizes – so the jelly belly penguin is also a favorite of mine. Then we get into silver jewelry. In general, I love silver jewelry of all kinds. As far as Mexican silver jewelry, I have several pieces by Margot de Taxco and I really like those. I also have a bracelet and some necklaces by Antonio Pineda that I really love. Another favorite that I wear all time was made for me by an American Arts and Crafts maker, Laurence Foss. I found out he was still alive and still making jewelry at the age of 80, and at the time I was working on my book, so I interviewed him and then commissioned a piece that he made for me with amethyst, similar in style to a piece that I had in my book. Because it was made especially for me by hand by him, I really treasure that piece. I’m also a fan of Finnish jewelry. The Finns’ approach to design is very unique. When they found their own voice, which didn’t happen until after World War II, they designed some really remarkable jewelry. I have one bracelet in particular that was made in the early 1970s, and it’s a big square-faceted rock crystal set in a silver-hinged bangle. It’s very simple, but it’s what’s called architectonic. It’s bold and geometric. Collectors Weekly: You mentioned mourning jewelry. When did people start making mourning jewelry? Necklace with glass beads, c. 1870. Archaeological Revival. A woven yellow gold chain suspending vine leaf motifs alternating with purple glass bead bunches of grapes. S-hook clasp, attributed to Castellani. Romero: Memento Mori, which means “Remember you must die,” began in the 16th century, but the earliest jewelry that you’re most likely to find on the market today would be 18th century. You can definitely find 18th-century mourning jewelry made with hair and with pigment that was created using hair to paint funerary scenes, an urn and a weeping willow, all the symbolic motifs for mourning and remembrance. Sometimes there would be a person in the scene standing or sitting by a tomb and sometimes there’s a little inscription – “Not lost but gone before” and things like that. I just finished an appraisal of a major collection of over 425 pieces of hairwork and mourning jewelry and there’s an endless variety. The earliest pieces in her collection, which ended up being donated to FIDM, were from the 18th century, but I have another collector friend who has mourning pieces from the 17th century. It pretty much ended with the end of the 19th century. There were some pieces still made into the 20th century, but the whole idea of mourning changed by World War I. All forms of jewelry were made for mourning: earrings, necklaces, bracelets, watch chains, even tiaras made of hair. The hairwork jewelry was made for remembrance of a loved one whose hair was used to make the jewelry. Some people today find that repugnant and not very appealing, but there is a large collecting market for hairwork jewelry. The way it was done and the the techniques that were used to make it are pretty fascinating. There are two different kinds of hairwork. There’s jewelry that contained hair braided or with some kind of a pattern or theme. That tends to be mourning jewelry. Then there is hairwork jewelry, or table work because they use a worktable with these strands of hair. That type of jewelry was made entirely from hair with metal findings to attach it to the body. There are still people making it today. There’s even a collectors club. There’s a whole category of collectors of that kind of jewelry. Collectors Weekly: Five years from now, what kind of jewelry do you think people will be collecting? What are the trends? Romero: People already are collecting what’s worn now. There are lots of currently-working artists making jewelry and there are collectors for their work. That type of jewelry will continue to be collected, but it takes a certain kind of person to buy and wear it. It’s very different. It’s avant-garde, cutting edge. The piece I just got is made from recycled materials, which I love. I love the concept of taking something that would otherwise be thrown away and making it into a wearable work of art. I own several pieces like that. I think that type of jewelry is a very viable trend because we’re thinking green now. We’re thinking recyclable, so I think that is something that will continue to be a trend. Collectors Weekly: If somebody was new to collecting jewelry, what advice would you have for them? Romero: Buy what you like and not for investment; you can’t count on the value to go up and it might go down. If you buy what you love, you’ll enjoy it no matter what the market does. Find the best examples. Condition, quality, and craftsmanship are extremely important, so don’t buy something just because it’s cheap and say, “Well, it’s got this damage here, but it was only so much money.” I’ve done that, too. I’ve made that mistake, but buy the best you can afford, and find pieces that are in the best condition with the best craftsmanship and the best design. There are also several good organizations you should check into. There’s the American Society of Jewelry Historians and the Association for the Study of Jewelry and Related Arts (ASJRA). There’s also the British Society of Jewellery Historians. They have a wonderful newsletter magazine that they publish. There’s also SilverForum, which is an online discussion group primarily for 20th-century silver jewelry. The Costume Society of America is primarily involved with clothing. I’m a member, and I’m trying to get more jewelry people involved because of that connection with jewelry and clothing. I think it’s important for the two groups to interact. Collectors Weekly: Is there anything you’d like to add that we didn’t ask? Romero: One thing we haven’t talked about is doing research and the dangers of believing what you read. Research is an ongoing endeavor. As a jewelry historian, I am constantly doing research and finding information about things that were not known. We make assumptions about things sometimes and there are myths that are perpetuated in print. 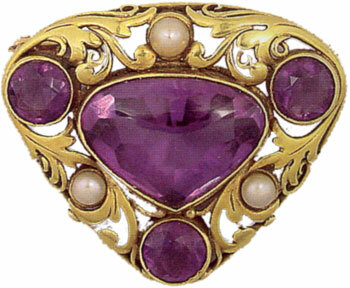 Suffragette jewelry is another category of collectible, documented in England. The suffragettes did wear jewelry. Purple, white, and green were the colors of the suffragette movement in England, and those colors were adopted by some of the suffragette groups in the United States. Trying to dispel myths is another thing I am concerned about. There are books out there that have erroneous information. I’m not saying that I know everything; far from it. I’ve made mistakes in my own books and I corrected them whenever I could, but you always need to arm yourself with knowledge. If you’re a collector, you need to educate yourself about what you’re collecting and do your own research. Find original source material that documents what you collect, and that will help you know more about your collection, be more knowledgeable in general, and appreciate what you collect even more. y business name is Poor Patsy. I thought your article was great and I have your Warman’s Jewelry: 3rd Edition. It,s become my new “bible”. I’ve had others but I especially like your comparison of fine jewelry with costume. I share your love of Mexican and Scandivian silver jewelry. Thank you for your kind comments about my interview and my third edition, Patsy! Happy to know you’re another silver jewelry lover. FYI, if you go to my site’s Reference/Jewelry Study Listservs page, you’ll find a link for SilverForum, a discussion group focused on 20th century modern silver jewelry, moderated by Marbeth Schon and Martha Trachtenberg. It’s a great group! I really enjoyed your interview Christie. I could feel your passion through your answers. I too have a passion for costume & vintage jewelry and it started with the collection of pretty much everything vintage such as porcelain, pottery, glass, etc. It is definitely much easier to collect jewelry when considering space. I learned a lot and know that I have much more to learn. It is too easy for me to spend hours upon hours researching. What a fun hobby! Wonderful interview, your passion and zeal for collecting and researching costume jewelry shines through. Thank you for all of the information you share- your research and knowledge have proved invaluable to me through the various editions of your book. I’ve been collecting for over 30 years- and I am still as interested and intrigued (and a little better informed) as when I started. Little sculptural works of art- costume jewelry is art made small and intimate, all the better to love and to wear! Great Interview! I was surprised how much ground you covered too! I love the Newark Unger Bros. and Kerr and have been collecting bakelite and glass etched pieces for years. I love cameos too, you gave me a whole lot of names to research now too! I can’t wait to read your book! Hello and thank you for such an educational page. I recently became the proud owner of an Edwardian Engagement Ring. It is platnium and has a 2.77 L colored VS1 diamond in the center. On the shoulders of the ring are flowers the petals are made up of hearts. down the side front of the ring are small inlaid sapphires. I love my ring so much. I want to find out all about it’s history that I can. However I am having a really hard time. How can I find the story behind my 100 year old ring? Can you assist me in finding the value of a 1930 / 1040 Trifari rhinestone pin ? I purchased a cut glass ring in Juneau, Alaska for $50.00 The shopowner called it “holocraft” design from the 1920s'”. However, I can’t find any such thing on the internet. If you could be so kind to respond. This is an amazing ring. Set in gold or brass – I am not sure. Nice setting w/ floral design and cut out edges. The stone is large and smooth – primary color is probably amber. I think it might be glass. The unique cuts of the glass create a holographic like prism design. Movement creates very beautiful subtle color changes incl. blue, purple, pink, and gold. I just love it and I would like to collect more of this style. I loved reading your interview with Christie. I had known her for over 20 years – first as a student, and most recently as someone who worked along side of her as her assistant. I am most sad to report that she passed away on Oct. 5, 2009 after a lengthly battle with cancer that she fought with much courage and determination. Her greatest love was sharing her vast knowledge of jewelry with those who loved the topic as much as she did. Her books will continue to educate new students which will be her legacy. There is a memorial guest book for all to read and sign at her center for jewelry studies web site. I have used Christie’s book for several years. I was doing some research online which led me to this site. I read her interview and then scrolled down to read the comments. I was sad to learn of her passing. What a great interview! I collect rhinestone jewelry, but recently have been researching older jewelry due to my mothers passing and leaving notes with jewelry worn by relatives. I came across a lovely black opal pendant signed G Hale. My search for information on this item brought me to Christie’s interview. Now I have a new passion, expanding my knowledge of all types of jewelry. I am on my way to purchase her book, as a resource to help identify and preserve the precious memories left to me lovingly by my mother. One of my first lectures on antique and period jewelry was with Christie. She was a wonderful teacher and I miss her! I had the great privilege to attend one of Christie’s lectures in Allentown, PA some years ago. She loved what she did and it definitely came through to all who met her. Christie’s vast knowledge of her subject and her willingness to share with others made her classes a joy! She was a delightful lady and she is greatly missed in the “Jewelry World”! Thank you. Very informative article. I’m older and never wore much jewelry as I garden outdoors a lot and have been afraid to lose pieces. However, I’ve inherited some fine jewelry and vintage costume pieces from my mother and grandmother which have piqued my interest. My grandmother’s Edwardian amethyst pendant on silver chain was just appraised at a high price. In addition was a rose gold necklace with small pearls and emeralds that my gt. grandfather picked up in India in the 1880s when he was posted there while in the British army. My mother had a nice collection of quality Trifari, etc. from the 1950s which have captured my interest. They certainly were well-made and many look just as contemporary today (2016). Do you feel synthetic gemstones have to be classed as costume jewelry or can they be fine in themselves, even though they are synthetic? “ ” They hired good, educated, Midwestern girls, gave them cars, and let them loose across the Midwest.